Moderate to severe eczema (atopic dermatitis) is notoriously difficult to treat. Patients suffer with extremely itchy, red, scaly bumps. Scratching leads to swelling, cracking, weeping, fissuring and, eventually, coarsening of the skin and pigmentation changes. Current management begins with instructions on proper skin care and prescription topical steroids. For those who have extensive disease or do not respond to topicals, phototherapy with narrowband ultraviolet B (nbUVB) is the next line treatment. Historically, patients who did not respond to phototherapy might be prescribed antibiotics, oral prednisone, or cyclosporine – all temporary solutions with significant side effects. 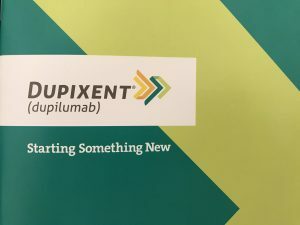 Enter Dupixent (dupilumab), a new biologic medication that was approved on March 28, 2017 and granted a “Breakthrough Therapy” designation by the FDA. Dupixent is an antibody that blocks inflammatory protein signaling in a pathway thought to be a major driver of atopic dermatitis. Whereas prednisone and cyclosporine suppress the immune system at large, dupixent targets the specific part of the immune system responsible. The safety and efficacy of Dupixent were established in three pivotal placebo-controlled clinical trials consisting of total of 2,119 adult patients with moderate-to-severe atopic dermatitis. Dupixent is an injection delivered under the skin. The initial dose is 300 mg (2 injections), followed by a single 150 mg injection every two weeks. In studies, patients taking Dupixent at this dose had a 67-72% improvement in their eczema after 16 weeks. Many patients also experienced a significant decrease in itch. The most common side effects included injection site reactions, reactivation of cold sores, eye/ eyelid inflammation, conjunctivitis (pink eye), and keratitis (corneal inflammation). There is no specific monitoring required for treatment with Dupixent. Patients should avoid live vaccines while on the medication. It has not yet been tested in pregnancy or in pediatric patients. Over recent years, biologic medications have revolutionized the treatment of psoriasis and changed the lives of many patients. Patients with eczema, on the other hand, have had few options until now with the launch of Dupixent. If you are suffering with eczema and have not responded to topicals, schedule a consultation with a dermatologist to see if you are a candidate for this breakthrough therapy.